Be the first to share your favorite memory, photo or story of Marie . This memorial page is dedicated for family, friends and future generations to celebrate the life of their loved one. 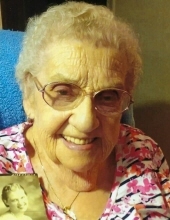 Marie (Wester) Lock, 100, formerly Lostant, passed away Tuesday, April 9, 2019 at her home in Liberty Estates Apartment, Peru. Mass of Christian Burial will be at 11 a.m. Saturday, April 13, 2019 at Sts. Peter & Paul Catholic Church, Leonore with Monsignor Philip Halfacre, pastor officiating. Burial will follow in the churches cemetery. Visitation will be from 4 p.m. to 7 p.m. Friday at the Mueller Funeral Home, Lostant with a prayer service at 3:45 p.m. Additional visitation will be from 10 a.m. to 11 a.m. Saturday morning in the church. Mrs. Lock was born on August 13, 1918 in Leonore to Gottfried and Anna (Ellwart) Wester. She married Willard “Short” Lock on April 6, 1940 at Sts. Peter & Paul Catholic Church, Leonore. Marie was a homemaker and worked at Bullheads Restaurant, Lostant Locker and Lostant School. She was a member of St. John’s the Baptist Church, Lostant. She loved her family, the Chicago Cubs, Nascar and horse racing. She is survived by her children, Jim (Linda) Lock of Tonica, Larry (Virginia) Lock of Bloomington, Bob (Nita) Lock of Humble, TX and Sally (Rich) Pyle of Fort Wayne, IN; 22 grandchildren; 42 great-grandchildren; 5 great-great grandchildren; and two daughter in-laws, Carol Lock of Peru and Jane Lock of Lostant. She was preceded in death by her parents; her husband; two sons, John and Eugene Lock; one granddaughter; one great-granddaughter; three great-grandsons; one great-great granddaughter; three brothers and two sisters. Pallbearers will be Jim Lock, Larry Lock, Bob Lock, Sally Lock Pyle, Jeff Lock and Dawn Lock Cordes. Memorial contributions may be directed to the donor’s choice. To send flowers or a remembrance gift to the family of Marie Lock, please visit our Tribute Store. "Email Address" would like to share the life celebration of Marie Lock. Click on the "link" to go to share a favorite memory or leave a condolence message for the family.